Institute Institute of Management is ready to hire the applicants for the 02 available seats of Junior Accounting Assistant Jobs as per the IIM Kozhikode Recruitment 2017 advertisement published on department web portal. Job seekers who have required eligibility may apply through Online Mode after reading all the details of IIM Kozhikode Recruitment 2017 through this section.Candidates who meet the eligibility criteria and interested to apply they can submit their application form before the last date that is 17th May 2017. Education Needed : Candidates who are willing to apply for IIM Kozhikode jobs must posses Graduation Degree (B.Com) from any recognized board or institution. Reserved category applicants will get the age relaxation as per IIM Kozhikode norms. Emoluments given to Employee: Contenders who will be appointed successfully for IIM Kozhikode Vacancy, they get the salary pay band of Rs. 11,300/- as per organization norms. Last Date For Applying Online Is : 17-05-2017. Click Here For IIM Kozhikode Official Notification Link. Translational Health Science and Technology is ready to hire the applicants for the 15 available seats of Coordinator, Nurse Jobs as per the THSTI Recruitment 2017 advertisement published on department web portal. Job seekers who have required eligibility may apply after reading all the details of THSTI Recruitment 2017 through this section.Candidates who have decided to build their career in this organization they can attend Walkin Interview which are going to be held On 11th May 2017 to 24th May 2017. Education Needed : Candidates who are willing to apply for THSTI jobs must posses 10th / 12th / Diploma / Graduation Degree / Post Graduation Degree from any recognized board or institution. Reserved category applicants will get the age relaxation as per THSTI norms. Selection of the job hunters will be done on the basis of their performance in the Skill Test, Personal Interview conducted by the selection committee. Click Here For THSTI Official Notification Link. Directorate of Economics and Statistics Gujarat is ready to hire the applicants for the 492 available seats of Research Officer, Statistics Assistant Jobs as per the DES Gujarat Recruitment 2017 advertisement published on department web portal. Job seekers who have required eligibility may apply through Offline Mode after reading all the details of DES Gujarat Recruitment 2017 through this section.You are needed to send the application form in the appropriate format at the below address till or before 17th May 2017. Education Needed : Candidates who are willing to apply for DES Gujarat jobs must posses Graduation Degree / Post Graduation Degree from any recognized board or institution. Reserved category applicants will get the age relaxation as per DES Gujarat norms. Application Has To Be Sent Latest By : 17-05-2017. Pondicherry University is ready to hire the applicants for the 20 available seats of Field Investigator Jobs as per the Pondicherry University Recruitment 2017 advertisement published on department web portal. Job seekers who have required eligibility may apply after reading all the details of Pondicherry University Recruitment 2017 through this section.Candidates who have decided to build their career in this organization they can attend Walkin Interview which are going to be held On 3rd May 2017. Education Needed : Candidates who are willing to apply for Pondicherry University jobs must posses Graduation Degree from any recognized board or institution. Reserved category applicants will get the age relaxation as per Pondicherry University norms. Emoluments given to Employee: Contenders who will be appointed successfully for Pondicherry University Vacancy, they get the salary pay band of Rs. 1,000/- Per Day. as per organization norms. Date of Interview : 03-05-2017. Click Here For Pondicherry University Official Notification Link. Commissionerate of Health Medical Services and Medical Education is ready to hire the applicants for the 212 available seats of Professor Jobs as per the CHMS & ME Recruitment 2017 advertisement published on department web portal. Job seekers who have required eligibility may apply after reading all the details of CHMS & ME Recruitment 2017 through this section.Candidates who have decided to build their career in this organization they can attend Walkin Interview which are going to be held On 5th May 2017 to 19th May 2017. Education Needed : Candidates who are willing to apply for CHMS & ME jobs must read official notification for post wise qualification. The candidates who wish to apply for the available vacancy should not be more than 45 Years (Professor), 40 Years (Associate Professor), 35 Years (Assistant Professor). Reserved category applicants will get the age relaxation as per CHMS & ME norms. Emoluments given to Employee: Contenders who will be appointed successfully for CHMS & ME Vacancy, they get the salary pay band of Rs. 37,400 - 67,000/- (Professor & Associate Professor) Rs. 15,600 - 39,100/- (Assistant Professor) plus Grade Pay of Rs. 10000/- (Professor), Rs. 9000/- (Associate Professor), Rs. 7000/- & 5400/- (Assistant Professor) as per organization norms. Walk in Interview Held On : 05-05-2017 to 19-05-2017. Click Here For CHMS & ME Official Notification Link. Department of Commerce Industry & Employment Exchange Madhya Pradesh is ready to hire the applicants for the 10 available seats of Facilitator Jobs as per the Department of Commerce Industry & Employment Exchange MP Recruitment 2017 advertisement published on department web portal. Job seekers who have required eligibility may apply after reading all the details of Department of Commerce Industry & Employment Exchange MP Recruitment 2017 through this section.Candidates who meet the eligibility criteria and interested to apply they can send their soft copy of application form through Email before the last date that is 30th April 2017. Education Needed : Candidates who are willing to apply for Department of Commerce Industry & Employment Exchange MP jobs must posses Graduation Degree from any recognized board or institution. Reserved category applicants will get the age relaxation as per Department of Commerce Industry & Employment Exchange MP norms. Closing Date to Send Copy of Application Form Is : 30-04-2017. Click Here For Department of Commerce Industry & Employment Exchange MP Official Notification Link. Defence Laboratory Jodhpur is ready to hire the applicants for the 04 available seats of JRF Jobs as per the Defence Laboratory Jodhpur Recruitment 2017 advertisement published on department web portal. Job seekers who have required eligibility may apply after reading all the details of Defence Laboratory Jodhpur Recruitment 2017 through this section.Candidates who have decided to build their career in this organization they can attend Walkin Interview which are going to be held On 8th May 2017 - 10th May 2017. Education Needed : Candidates who are willing to apply for Defence Laboratory Jodhpur jobs must posses Engineering Degree / Post Graduation Degree from any recognized board or institution. Reserved category applicants will get the age relaxation as per Defence Laboratory Jodhpur norms. Emoluments given to Employee: Contenders who will be appointed successfully for Defence Laboratory Jodhpur Vacancy, they get the salary pay band of Rs. 25,000/-. as per organization norms. Date of Interview : 08-05-2017 - 10-05-2017. Click Here For Defence Laboratory Jodhpur Official Notification Link. Sainik School Bijapur is ready to hire the applicants for the 01 available seats of Mess Manager Jobs as per the Sainik School Bijapur Recruitment 2017 advertisement published on department web portal. Job seekers who have required eligibility may apply through Offline Mode after reading all the details of Sainik School Bijapur Recruitment 2017 through this section.You are needed to send the application form in the appropriate format at the below address till or before 19th May 2017. Education Needed : Candidates who are willing to apply for Sainik School Bijapur jobs must posses 10th from any recognized board or institution. The candidates who wish to apply for the available vacancy should be existing between 18 - 50 Years As On 01-07-2017. Reserved category applicants will get the age relaxation as per Sainik School Bijapur norms. Emoluments given to Employee: Contenders who will be appointed successfully for Sainik School Bijapur Vacancy, they get the salary pay band of Rs. 5200 - 20,200/- plus 2800/- Grade Pay as per organization norms. Last Date to Submit Hard Copy of Application Form Is : 19-05-2017. Click Here For Sainik School Bijapur Official Notification Link. National Food Security Mission Hyderabad is ready to hire the applicants for the 02 available seats of Technical Assistants Jobs as per the NFSM Hyderabad Recruitment 2017 advertisement published on department web portal. Job seekers who have required eligibility may apply through Offline Mode after reading all the details of NFSM Hyderabad Recruitment 2017 through this section.You are needed to send the application form in the appropriate format at the below address till or before With In 20 Day's. Education Needed : Candidates who are willing to apply for NFSM Hyderabad jobs must posses Post Graduation Degree from any recognized board or institution. The candidates who wish to apply for the available vacancy should be existing between 21 - 35 Years As On 01-05-2017. Reserved category applicants will get the age relaxation as per NFSM Hyderabad norms. Emoluments given to Employee: Contenders who will be appointed successfully for NFSM Hyderabad Vacancy, they get the salary pay band of Rs. 25,000/-. as per organization norms. Selection of the job hunters will be done on the basis of their performance in the Interview, Personal Talk conducted by the selection committee. Last Date of Receipt of Applications : With In 20 Day's. Click Here For NFSM Hyderabad Official Notification Link. 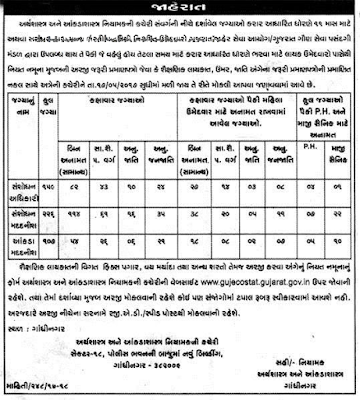 National Food Security Mission Gujarat is ready to hire the applicants for the 44 available seats of Consultant, Technical Assistant Jobs as per the NFSM Gujarat Recruitment 2017 advertisement published on department web portal. Job seekers who have required eligibility may apply through Offline Mode after reading all the details of NFSM Gujarat Recruitment 2017 through this section.You are needed to send the application form in the appropriate format at the below address till or before 6th May 2017. Education Needed : Candidates who are willing to apply for NFSM Gujarat jobs must posses Graduation Degree / Post Graduation Degree from any recognized board or institution. Reserved category applicants will get the age relaxation as per NFSM Gujarat norms. Emoluments given to Employee: Contenders who will be appointed successfully for NFSM Gujarat Vacancy, they get the salary pay band of Rs. 50,000/- (Post 1), Rs. 25,000/- (Post 2-3), Rs. 30,000/- (Post 4), Rs. 20,000/- (Post 5) as per organization norms. Last Date for Receiving Hard Copy of Application Form Is : 06-05-2017. Click Here For NFSM Gujarat Official Notification Link. Kannur International Airport Limited is ready to hire the applicants for the 88 available seats of Manager, Supervisor Jobs as per the KIAL Recruitment 2017 advertisement published on department web portal. Job seekers who have required eligibility may apply through Online Mode after reading all the details of KIAL Recruitment 2017 through this section.Candidates who meet the eligibility criteria and interested to apply they can submit their application form before the last date that is 10th May 2017. Education Needed : Candidates who are willing to apply for KIAL jobs must posses 10th / 12th / Diploma / Graduation Degree from any recognized board or institution. The candidates who wish to apply for the available vacancy should not be more than 55 Years (Post 1), 50 Years (Post 2-5,7), 45 Years (Post 6,8,9,11), 50 Years (Post 10), 35 Years (Post 12,13,14), 30 Years (Post 15). Reserved category applicants will get the age relaxation as per KIAL norms. Emoluments given to Employee: Contenders who will be appointed successfully for KIAL Vacancy, they get the salary pay band of Rs. 50,000/- (Post 2-7), Rs. 45,000/- (Post 8), Rs. 35,000/- (Post 9,10), Rs. 30,000/- (Post 11), Rs. 25,000/- (Post 12), Rs. 20,000/- (Post 13,14), Rs. 17,500/- (Post 15) as per organization norms. Selection of the job hunters will be done on the basis of their performance in the Written Exam, Personal Interview, Physical Efficiency Test, Skill Test conducted by the selection committee. Dead Line To Submit Online Application Is : 10-05-2017. Click Here For KIAL Official Notification Link. Goa University is ready to hire the applicants for the 29 available seats of Stenographer, Store Keeper Jobs as per the Goa University Recruitment 2017 advertisement published on department web portal. Job seekers who have required eligibility may apply after reading all the details of Goa University Recruitment 2017 through this section.Candidates who have decided to build their career in this organization they can attend Walkin Interview which are going to be held On 3rd May 2017 - 11th May 2017. Education Needed : Candidates who are willing to apply for Goa University jobs must posses 12th from any recognized board or institution. Reserved category applicants will get the age relaxation as per Goa University norms. Emoluments given to Employee: Contenders who will be appointed successfully for Goa University Vacancy, they get the salary pay band of Rs. 30,375/- (Post 1-2), Rs. 17,100/- (Post 3-6), Rs. 15,750/- (Post 7), 15,975/- (Post 8) as per organization norms. Date of Interview : 03-05-2017 - 11-05-2017. Click Here For Goa University Official Notification Link. Maharashtra State Electricity Distribution Company Ltd. is ready to hire the applicants for the 01 available seats of Chief Legal Advisor Jobs as per the MAHADISCOM Recruitment 2017 advertisement published on department web portal. Job seekers who have required eligibility may apply through Offline Mode after reading all the details of MAHADISCOM Recruitment 2017 through this section.You are needed to send the application form in the appropriate format at the below address till or before 15th May 2017. Organization Name: Maharashtra State Electricity Distribution Company Ltd.
Education Needed : Candidates who are willing to apply for MAHADISCOM jobs must posses Graduation Degree (Law) from any recognized board or institution. The candidates who wish to apply for the available vacancy should not be more than 65 Years. Reserved category applicants will get the age relaxation as per MAHADISCOM norms. Emoluments given to Employee: Contenders who will be appointed successfully for MAHADISCOM Vacancy, they get the salary pay band of Rs. 45,900-1950-88,800/- as per organization norms. The Last date For Acceptance of Application Forms : 15-05-2017. Click Here For MAHADISCOM Official Notification Link. Rajiv Gandhi National University of Law is ready to hire the applicants for the 02 available seats of Research Associates, Research Assistant Jobs as per the RGNUL Recruitment 2017 advertisement published on department web portal. Job seekers who have required eligibility may apply after reading all the details of RGNUL Recruitment 2017 through this section.Candidates who have decided to build their career in this organization they can attend Walkin Interview which are going to be held On 3rd May 2017. Education Needed : Candidates who are willing to apply for RGNUL jobs must posses Graduation Degree from any recognized board or institution. Reserved category applicants will get the age relaxation as per RGNUL norms. Emoluments given to Employee: Contenders who will be appointed successfully for RGNUL Vacancy, they get the salary pay band of Rs. 10,000/- (Post 1), Rs. 8,000/- (Post 2) as per organization norms. Walk in Interview Held On : 03-05-2017. Click Here For RGNUL Official Notification Link. NTPC BHEL Power Projects Private Limited is ready to hire the applicants for the 03 available seats of Executive Jobs as per the NBPPL Recruitment 2017 advertisement published on department web portal. Job seekers who have required eligibility may apply through Offline Mode after reading all the details of NBPPL Recruitment 2017 through this section.You are needed to send the application form in the appropriate format at the below address till or before 31st May 2017. Education Needed : Candidates who are willing to apply for NBPPL jobs must posses Engineering Degree from any recognized board or institution. Job hunters belonging to SC/ PWD (Persons with Disability) Category are exempted from such payment of processing fee. The candidates who wish to apply for the available vacancy should not be more than 30 Years As On 30-04-2017. Reserved category applicants will get the age relaxation as per NBPPL norms. Emoluments given to Employee: Contenders who will be appointed successfully for NBPPL Vacancy, they get the salary pay band of Rs. 46,920/- as per organization norms. Closing Date to Submit Hard Copy of Application Form Is : 31-05-2017. Click Here For NBPPL Official Notification Link. Central Council for Research in Siddha is ready to hire the applicants for the 02 available seats of Upper Division Clerk Jobs as per the CCRS Recruitment 2017 advertisement published on department web portal. Job seekers who have required eligibility may apply through Offline Mode after reading all the details of CCRS Recruitment 2017 through this section.You are needed to send the application form in the appropriate format at the below address till or before 20th June 2017. Education Needed : Candidates who are willing to apply for CCRS jobs must posses Graduation Degree from any recognized board or institution. Those aspirants who are belonging to OBC Category & interested to apply for above posts they need to be paid Processing fee of 200/-. Job hunters belonging to SC Category & interested to apply for above posts they need to be paid Processing fee of 100/-. The candidates who wish to apply for the available vacancy should be existing between 18 - 27 Years As On 20-06-2017. Reserved category applicants will get the age relaxation as per CCRS norms. Emoluments given to Employee: Contenders who will be appointed successfully for CCRS Vacancy, they get the salary pay band of Rs. 5,200 - 20,200/- plus 2400/- Grade Pay as per organization norms. Closing Date to Submit the Application Form : 20-06-2017. Click Here For CCRS Official Notification Link. Indian Association for the Cultivation of Science is ready to hire the applicants for the 24 available seats of Scientist, Research Associate Jobs as per the IACS Recruitment 2017 advertisement published on department web portal. Job seekers who have required eligibility may apply after reading all the details of IACS Recruitment 2017 through this section.Candidates who meet the eligibility criteria and interested to apply they can send their soft copy of application form through Email before the last date that is 26th July 2017. Education Needed : Candidates who are willing to apply for IACS jobs must posses Ph.D. / Post Graduation Degree from any recognized board or institution. Reserved category applicants will get the age relaxation as per IACS norms. Emoluments given to Employee: Contenders who will be appointed successfully for IACS Vacancy, they get the salary pay band of Rs. 70,000/- (Post 1), Rs. 36,000 - 40,000/- (Post 2), Rs. 30,000/- (Post 3) as per organization norms. Closing Date to Send Copy of Application Form Is : 26-07-2017. Click Here For IACS Official Notification Link. Chief District Medical Officer Balangir is ready to hire the applicants for the 07 available seats of Senior Treatment Supervisor Jobs as per the CDMO Balangir Recruitment 2017 advertisement published on department web portal. Job seekers who have required eligibility may apply after reading all the details of CDMO Balangir Recruitment 2017 through this section.Candidates who have decided to build their career in this organization they can attend Walkin Interview which are going to be held On 3rd May 2017. Education Needed : Candidates who are willing to apply for CDMO Balangir jobs must posses Graduation Degree from any recognized board or institution. The candidates who wish to apply for the available vacancy should be existing between 21 - 65 Years As On 01-04-2017. Reserved category applicants will get the age relaxation as per CDMO Balangir norms. Emoluments given to Employee: Contenders who will be appointed successfully for CDMO Balangir Vacancy, they get the salary pay band of Rs. 15,800/- as per organization norms. Walk In Date : 03-05-2017. Click Here For CDMO Balangir Official Notification Link. Eklavya Adarsh Residential School is ready to hire the applicants for the Various available seats of PGT, TGT, Lab Assistant Jobs as per the Eklavya Adarsh Residential School Recruitment 2017 advertisement published on department web portal. Job seekers who have required eligibility may apply through Offline Mode after reading all the details of Eklavya Adarsh Residential School Recruitment 2017 through this section.You are needed to send the application form in the appropriate format at the below address till or before 10th May 2017. Education Needed : Candidates who are willing to apply for Eklavya Adarsh Residential School jobs must posses Graduation Degree / Post Graduation Degree from any recognized board or institution. Reserved category applicants will get the age relaxation as per Eklavya Adarsh Residential School norms. Emoluments given to Employee: Contenders who will be appointed successfully for Eklavya Adarsh Residential School Vacancy, they get the salary pay band of Rs. 15,000/- (PGT), Rs. 13,500/- (TGT) as per organization norms. Last Date to Submit Hard Copy of Application Form Is : 10-05-2017. Click Here For Eklavya Adarsh Residential School Official Notification Link. Chandigarh State Legal Services Authority is ready to hire the applicants for the 04 available seats of Steno-Typist, Clerk Jobs as per the CSLSA Recruitment 2017 advertisement published on department web portal. Job seekers who have required eligibility may apply through Offline Mode after reading all the details of CSLSA Recruitment 2017 through this section.You are needed to send the application form in the appropriate format at the below address till or before 25th May 2017. Education Needed : Candidates who are willing to apply for CSLSA jobs must posses 8th / Graduation Degree from any recognized board or institution. Job hunters belonging to Reserved Category & interested to apply for above posts they need to be paid Processing fee of 80/-. The candidates who wish to apply for the available vacancy should be existing between 18 to 37 years as on 01-01-2017. Reserved category applicants will get the age relaxation as per CSLSA norms. Emoluments given to Employee: Contenders who will be appointed successfully for CSLSA Vacancy, they get the salary pay band of Rs. 10300 - 34800/- With 3200/- Grade Pay (Post 1,2), Rs. 4900 - 10680/- With 1650/- Grade Pay (Post 3) as per organization norms. Deadline to Submit the Application Is : 25-05-2017. Click Here For CSLSA Official Notification Link. Tenughat Vidyut Nigam Limited is ready to hire the applicants for the 49 available seats of Computer Typist, Clerk Jobs as per the TVNL Recruitment 2017 advertisement published on department web portal. Job seekers who have required eligibility may apply through Online Mode after reading all the details of TVNL Recruitment 2017 through this section.Candidates who meet the eligibility criteria and interested to apply they can submit their application form before the last date that is 1st May 2017. Education Needed : Candidates who are willing to apply for TVNL jobs must posses Graduation Degree from any recognized board or institution. Those aspirants who are belonging to General/ BC I/ BC II Category & interested to apply for above posts they need to be paid Processing fee of 500/-. Job hunters belonging to SC/ST of Jharkhand Category & interested to apply for above posts they need to be paid Processing fee of 250/-. The candidates who wish to apply for the available vacancy should not be more than 35 Years As On 31-08-2016. Reserved category applicants will get the age relaxation as per TVNL norms. Emoluments given to Employee: Contenders who will be appointed successfully for TVNL Vacancy, they get the salary pay band of Rs. 5,200 - 20,200/- plus 3300/3000/- Grade Pay as per organization norms. Opening Date of Online Registration of Application Form Is : 21-04-2017. Dead Line For Apply Online : 01-05-2017. Click Here For TVNL Official Notification Link. Bihar State Co-Operative Marketing Union Limited is ready to hire the applicants for the 122 available seats of Marketing Officer, Multi Tasking Staff Jobs as per the BISCOMAUN Recruitment 2017 advertisement published on department web portal. Job seekers who have required eligibility may apply through Online Mode after reading all the details of BISCOMAUN Recruitment 2017 through this section.Candidates who meet the eligibility criteria and interested to apply they can submit their application form before the last date that is 20th May 2017. Education Needed : Candidates who are willing to apply for BISCOMAUN jobs must posses 12th / Diploma / Graduation Degree / Post Graduation Degree from any recognized board or institution. Job hunters belonging to SC/ ST/ PWD (Persons with Disability) Category & interested to apply for above posts they need to be paid Processing fee of 300/-. The candidates who wish to apply for the available vacancy should be existing between 21 - 37 Years. Reserved category applicants will get the age relaxation as per BISCOMAUN norms. Emoluments given to Employee: Contenders who will be appointed successfully for BISCOMAUN Vacancy, they get the salary pay band of Rs. 20,000 - 35,338/- (Post 1), Rs. 15,000 - 26,502/- (Post 2-4), Rs. 12,000 - 21,201/- (Post 5) as per organization norms. Starting Date of Online Registration of Application Form Is : 23-04-2017. Closing Date For Apply Online : 20-05-2017. Click Here For BISCOMAUN Official Notification Link. District Child Protection Unit is ready to hire the applicants for the 11 available seats of Superintendent, Counsellor Jobs as per the DCPU Recruitment 2017 advertisement published on department web portal. Job seekers who have required eligibility may apply through Offline Mode after reading all the details of DCPU Recruitment 2017 through this section.You are needed to send the application form in the appropriate format at the below address till or before 27th April 2017. Education Needed : Candidates who are willing to apply for DCPU jobs must posses Diploma / Graduation Degree / Post Graduation Degree from any recognized board or institution. The candidates who wish to apply for the available vacancy should be existing between 21 to 35 Years As on 01-04-2017. Reserved category applicants will get the age relaxation as per DCPU norms. End Date To Submit Hard Copy of Application Form Is : 27-04-2017. West Sikkim District Court is ready to hire the applicants for the 08 available seats of Peon, Residential Orderly Jobs as per the WSDC Recruitment 2017 advertisement published on department web portal. Job seekers who have required eligibility may apply through Offline Mode after reading all the details of WSDC Recruitment 2017 through this section.You are needed to send the application form in the appropriate format at the below address till or before 20th May 2017. Education Needed : Candidates who are willing to apply for WSDC jobs must posses 5th / 8th from any recognized board or institution. The candidates who wish to apply for the available vacancy should be existing between 18 to 30 Years As on 20-05-2017. Reserved category applicants will get the age relaxation as per WSDC norms. Emoluments given to Employee: Contenders who will be appointed successfully for WSDC Vacancy, they get the salary pay band of Rs. 5,200 - 20,200/- plus 2300/2400/- Grade Pay as per organization norms. Selection of the job hunters will be done on the basis of their performance in the Test, Personal Interview conducted by the selection committee. Last Date for the Submission of Application : 20-05-2017. Click Here For WSDC Official Notification Link. Department of Disaster Management and Civil Defence West Bengal is ready to hire the applicants for the 03 available seats of Management Specialist, Disaster Professional Jobs as per the Department of Disaster Management and Civil Defence West Bengal Recruitment 2017 advertisement published on department web portal. Job seekers who have required eligibility may apply through Offline Mode after reading all the details of Department of Disaster Management and Civil Defence West Bengal Recruitment 2017 through this section.You are needed to send the application form in the appropriate format at the below address till or before 22nd May 2017. Education Needed : Candidates who are willing to apply for Department of Disaster Management and Civil Defence West Bengal jobs must posses Post Graduation Degree from any recognized board or institution. The candidates who wish to apply for the available vacancy should not be more than 50 Years (Post 1), 40 Years (Post 2). Reserved category applicants will get the age relaxation as per Department of Disaster Management and Civil Defence West Bengal norms. Emoluments given to Employee: Contenders who will be appointed successfully for Department of Disaster Management and Civil Defence West Bengal Vacancy, they get the salary pay band of Rs. 50,000/- (Post 1), Rs. 40,000/- (Post 2) as per organization norms. End Date To Submit Hard Copy of Application Form Is : 22-05-2017. Click Here For Department of Disaster Management and Civil Defence West Bengal Official Notification Link. Indian Institute of Chemical Biology is ready to hire the applicants for the 20 available seats of Junior Research Fellow Jobs as per the IICB Recruitment 2017 advertisement published on department web portal. Job seekers who have required eligibility may apply after reading all the details of IICB Recruitment 2017 through this section.Candidates who have decided to build their career in this organization they can attend Walkin Interview which are going to be held On 26th April 2017. Education Needed : Candidates who are willing to apply for IICB jobs must posses M.Sc (Chemistry / Biology) / Post Graduation Degree from any recognized board or institution. The candidates who wish to apply for the available vacancy should not be more than 28 Years As On 26-04-2017. Reserved category applicants will get the age relaxation as per IICB norms. Walk in Interview Held On : 26-04-2017. Click Here For IICB Official Notification Link.